Working with the natural balance and flow of the land, our world-class course has been designed to deliver a genuinely timeless playing experience by the legendary ‘Open’ champion, Tom Weiskopf. To honour his ‘Open’ win in 1973, the imaginative layout has 73 bunkers and a length of 7,373 yards o the back tees. The large double green immediately in front of the clubhouse, along with the revetted bunkers on every hole pay homage to the renowned St Andrews golf experience. With soft rolling undulations, a variety of steps and collection areas, shots into the greens will be reassuringly demanding. Another unique feature of the course is the challenging 19th ‘bye-hole’, which allows matches to be determined without returning to the first tee. As our members would expect, the course will be fast running with several tees on each hole that allow play to be enjoyed by golfers of all levels of expertise. 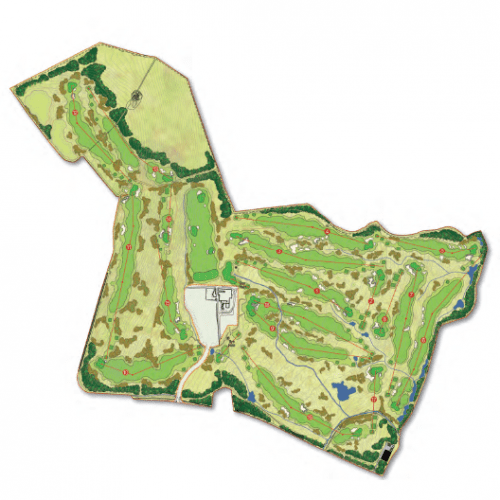 To allow members to finely tune their game, Tom has designed a magnificent practice facility, comprising a 400 yard long range with a variety of targets, as well as a special short game area, featuring a number of challenging bunker styles. Furthermore, there is an extensive and meticulously prepared practice putting green, calculated to reflect authentic on-course conditions. Tom’s true passion is as a golf course designer. His experience, creativity, commitment to detail and philosophy have earned him a distinguished reputation. Tom has designed 65 golf courses, seven of which feature in the top 100 in the world rankings. These include courses in Scotland, Europe, South Africa, Asia-Pacific, the Caribbean and United States, with Troon Country Club in Scottsdale, Arizona voted ‘The Best New Private Club’ in its opening year. Tom Weiskopf achieved a remarkable level of excellence few players have ever attained. During his thirty plus years on the PGA and Senior PGA tours he enjoyed twenty-five victories including the coveted ‘Open’ Championship in 1973 and the US Seniors Open Championship in 1995. Voted “Player of the Year” in 1973, he went on to win five tournaments in an eight-week period – an era record.